This article is about the mobile phone technology. For the channel access method, see Code-division multiple access. CDMA2000 (also known as C2K or IMT Multi‑Carrier (IMT‑MC)) is a family of 3G mobile technology standards for sending voice, data, and signaling data between mobile phones and cell sites. It is developed by 3GPP2 as a backwards-compatible successor to second-generation cdmaOne (IS-95) set of standards and used especially in North America and South Korea. CDMA2000 compares to UMTS, a competing set of 3G standards, which is developed by 3GPP and used in Europe, Japan, and China. All are approved radio interfaces for the ITU's IMT-2000. In the United States, CDMA2000 is a registered trademark of the Telecommunications Industry Association (TIA-USA). 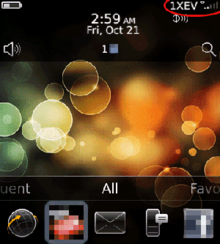 BlackBerry smartphone displaying '1XEV' as the service status in the upper right corner. CDMA2000 1xEV-DO (Evolution-Data Optimized), often abbreviated as EV-DO or EV, is a telecommunications standard for the wireless transmission of data through radio signals, typically for broadband Internet access. It uses multiplexing techniques including code division multiple access (CDMA) as well as time-division access to maximize both individual user's throughput and the overall system throughput. It is standardized (IS-856) by 3rd Generation Partnership Project 2 (3GPP2) as part of the CDMA2000 family of standards and has been adopted by many mobile phone service providers around the world – particularly those previously employing CDMA networks. 1X Advanced(Rev.E) is the evolution of CDMA2000 1X. It provides up to four times the capacity and 70% more coverage compared to 1X. The CDMA Development Group states that, as of April 2014, there are 314 operators in 118 countries offering CDMA2000 1X and/or 1xEV-DO service. The intended 4G successor to CDMA2000 was UMB (Ultra Mobile Broadband); however, in November 2008, Qualcomm announced it was ending development of the technology, favoring LTE instead. ^ "What really is a Third Generation (3G) Mobile Technology" (PDF). International Telecommunications Union. Archived from the original (PDF) on June 7, 2011. Retrieved October 28, 2012. ^ "CDG : Technology : CDMA2000 1X". CDMA Development Group. Retrieved July 28, 2017. ^ "Evolution of CDMA Roadmap—Voice Perspective" (PDF). Alcatel-Lucent. May 13, 2010. ^ "Guidelines for using cdma2000 1x Revision E Features on Earlier Revisions" (PDF). 3GPP2. July 2011. Archived from the original (PDF) on July 5, 2016. Retrieved May 17, 2016. ^ "1X Advanced". Qualcomm. Retrieved September 18, 2013. ^ "CDG : CDMA Statistics". CDMA Development Group. Retrieved June 13, 2015.